The Russian aircraft shot down by the Turkish air force on November 24 was a Sukhoi Su-24 bomber. These planes are playing an important role in Russian aerial operations against terrorist targets in Syria. Critical facts about the Su-24 military aircraft are outlined below. The Sukhoi Su-24 is a supersonic, all-weather bomber aircraft developed in the Soviet Union during the late 1960s and early 1970s. The NATO code name for the aircraft is ‘Fencer.’ Soviet crews, however, quickly nicknamed it “Chemodan” (Suitcase) for its versatility and weaponry. This twin-engine two-seater plane with a variable geometric wing is designed to perform ultra-low-level strike missions. 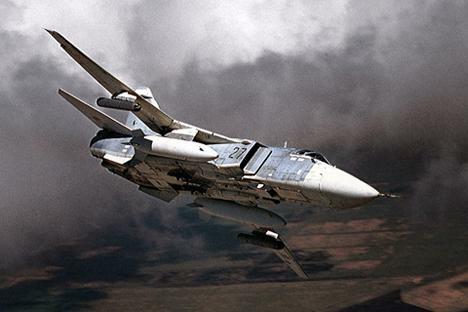 The Su-24 was the first Soviet-made aircraft to include an integrated digital navigation/attack system. When deployed by the Soviet Union in East Germany in 1979, the apparent capabilities of the aircraft aroused the concern of NATO intelligence services. Part of this initial fear stemmed from the assumption that the Sukhoi Su-24 used turbofan engines that could provide a greater range of attack. The Soviet air force used a number of Su-24s in Afghanistan in 1984. The aircraft entered combat again in the conflict in Chechnya in the 1990s. The Sukhoi Su-24 remains active in Algeria, Angola, Azerbaijan, Belarus, Iran, Kazakhstan, Libya, Syria, Ukraine and Uzbekistan and, of course, in Russia. It has also served in the Iraqi air force. Russia operates 577 Su-24 aircraft, with 447 serving with the Russian air force and 130 with the Russian navy. On April 10, 2014, Su-24 planes “buzzed” the new American destroyer USS Donald Cook in the Black Sea, flying past several times at close range. The U.S. vessel was moving along the edge of Russian territorial waters. The existing models of the Su-24M and Su-24MK are going through an upgrade and programme of improvement and extension of life. Among features to be upgraded are the GPS, multifunction displays and digital map generators. The weapons systems on board will also be upgraded with latest weaponry including the R-73 (AA-11 Archer) air-to-air missiles. The upgraded aircraft has been designated as the Su-24M2. In December 2014, the British Ministry of Defense reviewed plans for the defense of the Falkland Islands following British media reports that Russia had offered to lease Argentina 12 Sukhoi Su-24s in return for foodstuffs such as beef and wheat. British daily tabloid The Sun reported that this was part of an alleged Argentine plan to recover the islands with Russian support. The Argentinian government responded that "it had never considered" the possibility of leasing the Russian aircraft.